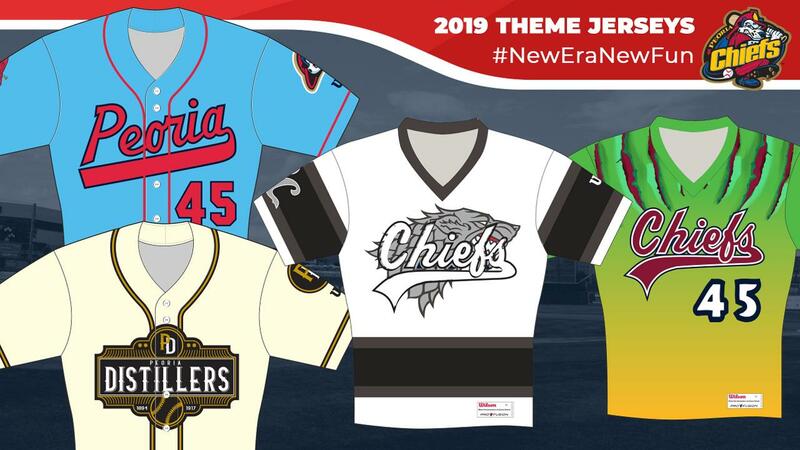 PEORIA, IL - The Peoria Chiefs have announced their specialty jerseys for the 2019 season in the fifth installment of the promotional schedule release. Previously the organization has announced six bobblehead giveaways, 22 fireworks nights, an assortment of giveaways and a comprehensive list of theme nights. A reminder that all promotions, giveaways and themes are subject to change. There will be seven specialty jersey auctions in 2019 and a few of the jerseys will be worn more than once. All have a charity tie-in though not all have been established yet. For the third season in a row the Chiefs will adopt the Peoria Distillers name and this year the jersey got a makeover. The Distillers will first appear for the Saturday, May 4 Battle for the Barrel against the Bowling Green Bootleggers. The jerseys will be worn again on Friday, July 12 and the auction will take place after the second game. The Chiefs will wear USA/Military themed red, white and blue jerseys on Armed Forces Night (Saturday, May 18) and also on Salute to the USA (Wednesday, July 3). The jerseys feature the Statue of Liberty on the front and back and the July 3 auction will benefit the Gold Star Families. For the first time in team history the Chiefs and the opposing Cedar Rapids Kernels will wear specialty jerseys to be auctioned off at Dozer Park on the same night, Saturday, June 8, which is Westeros Night as the Chiefs celebrate the final episodes of Game of Thrones. The Chiefs will wear white and black jerseys featuring the Stark family crest while the Kernels will wear red and gold jerseys featuring the Lannister family crest. Both jerseys will be auctioned by the Chiefs on June 8 for a yet TBA charity. The Chiefs will wear dinosaur themed jerseys on Friday, June 21 for Jurassic Ballpark night. The yellow and green jerseys will be auctioned off on June 21 to benefit the Pediatric Resource Center. Again this season the Chiefs will wear a specialty jersey on Harry Potter Night, Friday, August 2. The jerseys are still being designed and they will be auctioned off for a TBA charity. Saturday, August 10 is Organ Donor Night presented by Gift of Hope and will feature a donor themed jersey. These jerseys are in the final stages of design and the auction will raise money for Gift of Hope. The final jersey is the traditional Sunday baby blue throwbacks to the 1980s Cardinals jerseys. They will be worn on every home Sunday for the 2019 season and auctioned off at the end of the year. The Sunday baby blue auction benefits the Peoria Chiefs Community Foundation for Grants and Scholarships. Last season the Chiefs switched to online and text bidding and will again use Gesture in 2019 for all jersey auctions. Fans can access Chiefs.Gesture.com to sign up for an account or text CHIEFS to 52182 to register. Fans can track auctions and make bids from anywhere via their smartphone, tablet or PC and do not have to be at Dozer Park to win or pay for their jersey.